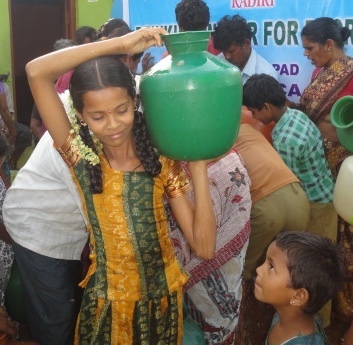 PAD aims to bring a Water Plant to 10 tribal villages of Kadiri Mandal, in Anantapur district, Andhra Pradesh. The Water Plant will directly benefit 1048 households (approximately 3400 individuals, including children). These tribal communities are in a district that experiences the second lowest rainfall in India, making drought very common and drinking water extremely scarce. There are no rivers or canals within this area, therefore the communities depend on ground water for drinking, cooking and cleaning. These communities also experience dangerously high levels of fluoride in the same ground water that they consume. This has led to dental and skeletal fluorosis throughout the region (http://www.fluoridealert.org/issues/health/skeletal_fluorosis/). Since members of these communities depend on agriculture as their main source of income, there are virtually no households with water-purifiers (typically very expensive to obtain) and the majority of people collect water from one communal well. PAD’s Water Plant will bring clean, potable water to a large demographic in desperate need. Posted by Shannon Radsky on Monday, December 2nd, 2013 at 9:33 pm.